Start reading Jane Austen's Pride and Prejudice on your Kindle in under a minute. 5.0 out of 5 starsSuper fun book! I’m really excited about this book—it combines two of my favorite things, reading and cooking. I haven’t had the chance to cook anything yet, but the photos of the recipes all look delicious. The book is really fun, and I love this concept. I’ll definitely be buying the others in the series! 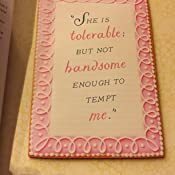 It also would make a great gift for any Jane Austen fans in your life. The photos of the recipes are lovely, and the illlustrations in the book are wonderful—piped icing flowers and painted iced cookies. The book did arrive damaged, so I am waiting for the replacement. But I’ve had great experiences with replacements from amazon in the past so I’m not worried about it. Edited to add more details, and to include that I received a new copy that is undamaged! This book is so beautiful and mixing the story with recipes and beautiful pictures is the best ever!! 5.0 out of 5 starsBeautiful combination of reading & cooking! My 12yo daughter and I are reading this book together as part of her home school curriculum this year, and I was so excited to find this version, which is BEAUTIFULLY illustrated throughout and accompanied with pastry recipes. I bought this as a Christmas present for my daughter, and I just can’t wait to start reading (and baking) with her! She’s a big fan of cooking shows, especially Great British Baking Show. This book has so many recipes; she’s going to be so excited! She loves to read and cook. What a great combination! I’ve already bought A Christmas Carol, by Charles Dickens, which is in this same series. I highly recommend both! I was really looking forward to this book. 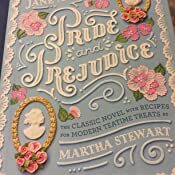 I love Jane Austen and Martha Stewart recipes. I regularly look to her for ideas for Christmas, Halloween especially and more. 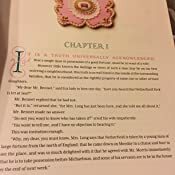 This is mostly Jane Austen’s work typed out and a sparse, hard to find recipe here or there of nothing much interesting or fresh. I’d say this one was phoned in by her team looking to bank on Austen fans and she put her name to it. 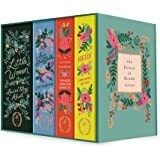 If you love Austen, you already have her books. 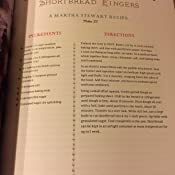 You buy MStewart for knocking recipes out of the park. I showed it to another friend over tea time, a professor of English and tea fan too for her thoughts. She gave it a sideways look after and a side eye. I couldn’t go lower than three because I love Jane and Martha recipes as a whole too much. 5.0 out of 5 starsA perfect ladies gift! High quality book! Print easy read. Beautiful colors! Recipes are great too! Very beautiful version. 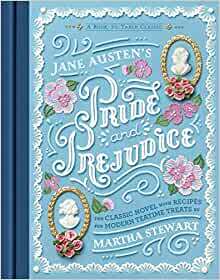 It was given as a gift to a young teenage granddaughter who is just beginning to read Jane Austen and she loved it. I bought this as a gift and my sister loves it! I think my mom was jealous I didn't get her one too. Lots of recipes in there with the story, lovely photos too.